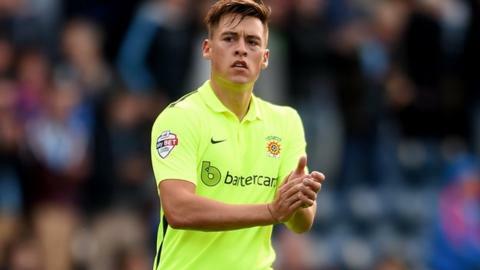 Promotion-chasing Tranmere Rovers have signed Hartlepool striker Scott Fenwick on loan for the rest of the season. Rovers, currently sixth in the National League, are keen to address a run of three draws which has seen them drop two points adrift of a play-off place. Fenwick, 25, has scored 12 goals in 49 games for Pools since moving from non-league side Dunston in November 2014. He is in contention to make an immediate debut in Friday's game at home against Lincoln City. "Scott is someone we have kept a close eye on this season," said Tranmere manager Gary Brabin. "He is a strong lad, a willing runner and has an eye for goal." Fenwick's arrival comes within 24 hours of another Rovers striker Jonny Margetts being allowed out on loan to relegation-threatened National League neighbours Southport.